Fleadh Cheoil Droichead Átha 2018 was the most successful yet, attracting over half a million visitors. Our volunteers were essential to the success of this event, Gráinne Berrill, Manager of Louth Volunteer Centre who are once again looking after the Fleadh Volunteer Programme said “Fleadh 2018 was a huge success and we know Fleadh 2019 is going to be even bigger and better. Last year’s volunteers were amazing and did a phenomenal job. Such a good job that we are expanding the volunteer programme and will need even more people to get involved in 2019”. Anyone over the age of 15 can volunteer, the minimum commitment is just one shift and there are a wide variety of volunteer roles available throughout the week of the Fleadh. 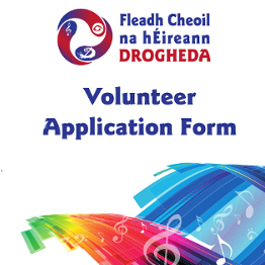 If you’d like to get involved in Fleadh 2019 as a volunteer click the apply button below and we will get back to you soon. If you are already registered as a Fleadh Volunteer, whether you helped out in 2018 or not, there is no need to complete the full form. Click Here to submit a very short form with your details so that we will know you would like to help out again.